A vertically scrolling "Bullet Hell" shooter. 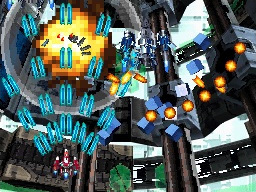 You choose between the Red Orion and Blue Nova (Easy and Hard modes, respectively), and shoot your way through 8 stages of enemy ships, collecting the cubes that fall when you destroy an enemy for power-ups and health and aiming for the high score. The Red Orion takes very little damage and has an impressive spread gun, while the Blue Orion had a vertical laser and dies with a single hit, providing for a much higher challenge. Your high scores with each ship can be uploaded to online leaderboards through the Nintendo Wi-Fi Connection.